The upper end of Friargate in the later 17th century based on a plan at Lancashire Archives (DDX194/9) and a copy of the plan at the Harris Reference Library, Preston, annotated with the names of property owners by Stephen Sartin. 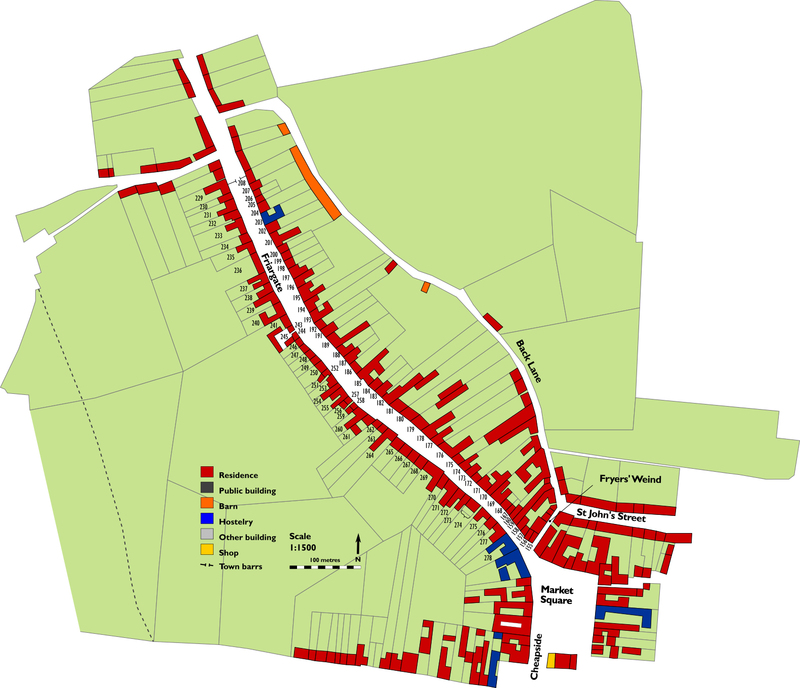 The annotation also identifies inns and taverns, barns and other buildings as well as indicating which properties extend to more than two storeys. The numbers are the ones on the annotated plan and relate to the list below. Note: DDX194/9 is an attempt at a visualisation based on original survey documents. Its accuracy is uncertain, but it does provide a feel for the townscape in 1685 (see The 1685 Survey of Preston for a detailed discussion of the 17th-century plans).